Saint George Cathedral and the Serbian-Orthodox episcopal cathedral face each other diagonally on cathedral square (Piaţa Unirii). Saint George Cathedral is known for its baroque interior and its images of saints, the episcopal cathedral is more influenced by occidental icons created by Constantin Daniel, a painter from Banat. The square is of urbanistic importance for Timişoara. After the city was destroyed by Prince Eugene’s troops it was redesigned like a chess board with the square at its centre. The square unites different architectural styles. On the one hand, one can see baroque churches, but also buildings in Hungarian art nouveau such as the former Hotel “Two Lions”. The county administration’s palace is a magnificent representative building and the Baroque Palace (Palatul Baroc) today holds Timişoara’s art museum. In the middle of the square, a plague column from 1740 can be seen. Furthermore, a column for the holy trinity and an artesian mineral water fountain, which is said to have miraculous effects, can be found. On Gheorghe- Lazăr-Street next to cathedral square, the largest German-language school of Romania is located. Nikolaus Lenau Lyzeum is today’s prestige school of Germans of Banat. In close vicinity Adam Müller Guttenbrunn House is located, a meeting point and elderly home for Germans of Banat which was given to the German community of Banat by the German government in 1994. The Democratic Forum of Germans in Banat (DFDB) has its offices here as well. 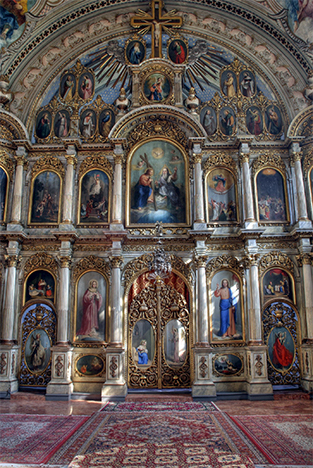 The iconostasis of the Serbian-Orthodox episcopal cathedral at Timişoara’s cathedral square was created by icon carver Janic and icon painter Constantin Daniel. 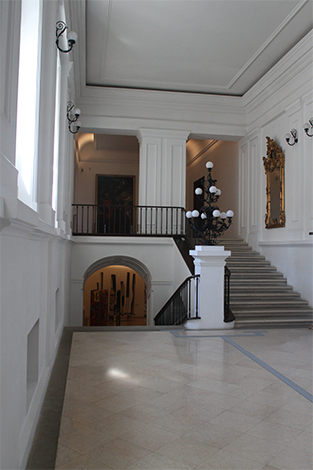 Foyer and stairwell of Timişoara’s art museum show the baroque interior of the former county administration’s palace.